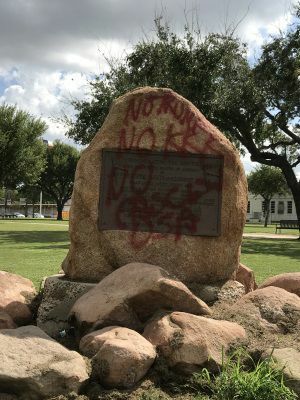 BROWNSVILLE — Someone has defaced the Jefferson Davis monument located at Washington Park near downtown Brownsville. Wording such as “No KKK” and “fascist USA” have been painted over the monument with red spray paint. The Jefferson Davis monument was erected in 1926 by the United Daughters of the Confederacy. It commemorates the president of the Confederate States of America. In January 2016, a petition drive was started to get the monument moved to a different location. A counter petition was also launched to keep the monument in place.